Rip and the Sleepy Hollow Boys are, in alphabetical order, Ken Lockwood-fiddle, Rich O'Hanley-guitar and lead vocals (because he knows the words to all the songs), Mario Rimoldi-banjo and vocals, and Tom Spallone-bass and vocals. (These are aliases because they're all wanted for impersonating bluegrass musicians.) Rip, a true mountain tenor, is sleeping it off somewhere. The band's based in Nelsonville, which gave inspiration to "Nelsonville Turnpike," a high-speed run down Rte. 301. Ken Lockwood: FiddleBorn along the banks of the Hackensack river, Ken has regrettably spent most of his formative years in Bergen County, NJ. While holding odd jobs and filling his head with stuff that wasn’t taught by the local educators, Ken passed the time by learning to draw, paint, play guitar and fiddle. He took a hiatus from playing music for a while and then, when he realized that playing fiddle would keep his hands busy while he tried to quit a 20-year nicotine habit, he started to get involved with music again. 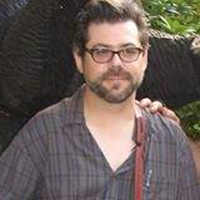 Playing traditional Irish music, bluegrass, and rock, Ken is now involved with local Irish music sessions and plays gigs regularly around the tristate area. 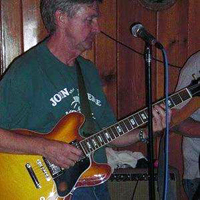 Rich O'Hanley: GuitarA jack of all styles and master of none, Rich counts among his influences Jerry Garcia, Jorma Kaukonen, David Bromberg, and Duane Allman. Aside from hearing Flatt & Scruggs theme songs on '60s sitcoms, it was Old and in the Way and the Nitty Gritty Dirt Band that piqued his interest in bluegrass. It was only then that he started listening to the Fathers of Bluegrass and seeing new bands at T.T. the Bear's Place and other Cambridge venues. Now it's bluegrass first and foremost, testing the forbearance of his family and friends. He still plays the D-18 he bought in 1975 with the pittance he saved while in the Army. To paraphrase Freelwheelin' Franklin, "A Martin will get you through times of no money better than money will get you through times of no Martin." Amen, brother! 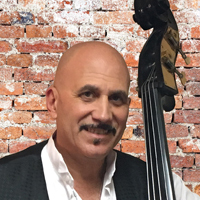 Mario Rimoldi: Banjo, VocalsMario Rimoldi was born in New Jersey but grew up in the Hudson Valley. He considers himself a late blooming Hippie because when he was young he dug through his Uncle Ray’s album collection and was influenced by The Beatles, the Rolling Stones, and, of course, the Grateful Dead. Later he heard the Old and in the Way album and it would peak his interest in Bluegrass Banjo. 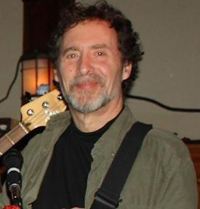 His influences are Earl Scruggs, Ralph Stanley, Jerry Garcia, and The Grateful Dead. Mario is also a guitar player, a portrait painter, and a big fan of the Beatles, Jimi Hendrix, and Neil Young. He lives in Nelsonville, NY. Tom Spallone BassTom is a native New Yorker and raised in Bergen County, NJ and is a current resident of the Hudson Valley. He picked up his sister’s guitar (without her knowledge, of course) at the age of 12 and added bass at 15 and has played music of almost every imaginable genre since. After a slight hiatus from music, he heard the call once again and realized that, "I ain’t dead yet!," preceded to get back in the woodshed. If he doesn’t have a bass or guitar around, he’s probably in the kitchen catering to his gastro-creativity, or watching a documentary that most people would never have the interest to watch.